Although we've been to the City Square Kirin countless times for Dim Sum and weddings, we've never had a regular dinner here. Well, there are a few reasons for this. When we did live relatively nearby, there were so many other choices of eats in Downtown and around. Besides, back then I seemed to be on a Chinese cooking kick and made it at home a lot. Viv just didn't want to eat Chinese food over and over again. Furthermore, Kirin isn't exactly a cheap place to merely have a meal. 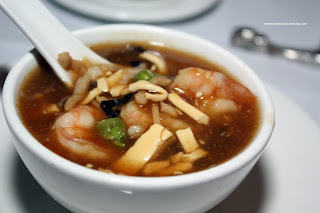 In my opinion, one can get quality Chinese food at bigger portions for less from a number of restaurants around town, particularly on the Eastside. And that doesn't necessarily mean going to dives either! Now the reason we were out at Kirin for dinner was due to Viv's aunt being generous and treating everyone (2 tables worth!). 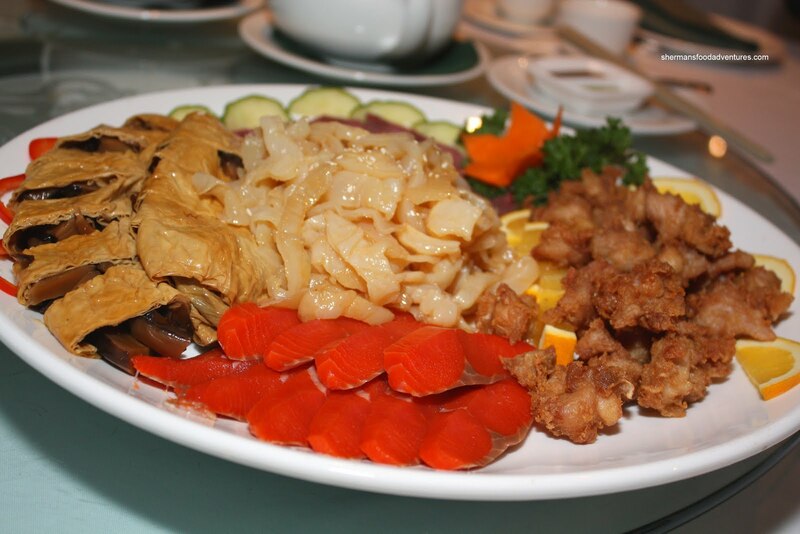 We started with a slightly stripped-down version (compared to weddings) of an Appetizer Platter consisting of Smoked Salmon, Vegetarian Goose, Fried Chicken Knees, Jellyfish and Beef Shank. Everything was solid with the exception of the chicken knees. They were very small (no meat attached) and fried a bit too long. Next up was the Hot & Sour Soup. Even before we tried it, I was prepared for the worst. You see, the best hot & sour soups are usually not found at restaurants such as Kirin. Now, I must concede that the ingredients were both top notch and plentiful. However, the soup was sorely lacking in spice and tartness, which essentially negates its existence. Once again, we have something that is made for the masses. Mild and safe. Something I didn't expect to arrive was the Lamb Hot Pot. Personally, I love lamb. Too bad not everyone has the same passion. Thus, I never rea lly get to eat it at a Chinese restaurant since the food is shared. Flavourwise, the dish wasn't too gamy due to the good amount of ginger. Most of the pieces were tender with a few exceptions (which is normal). 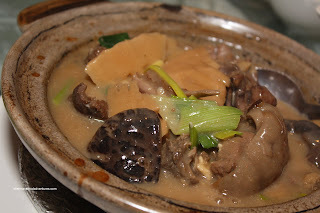 Of course, the thing that makes the lamb sing is the fermented tofu sauce. 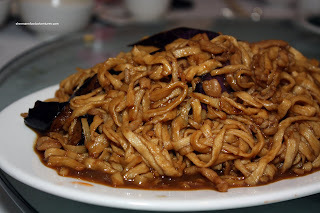 Now for the worst version of Fried Yee Mein I've ever seen. The most popular version of this dish involves soy, mushrooms and noodles. For some inexplicable reason, they put large chunks of eggplant into the mix. This only helped make this dish extremely wet with the noodles disintegrating on contact. Very poorly executed. 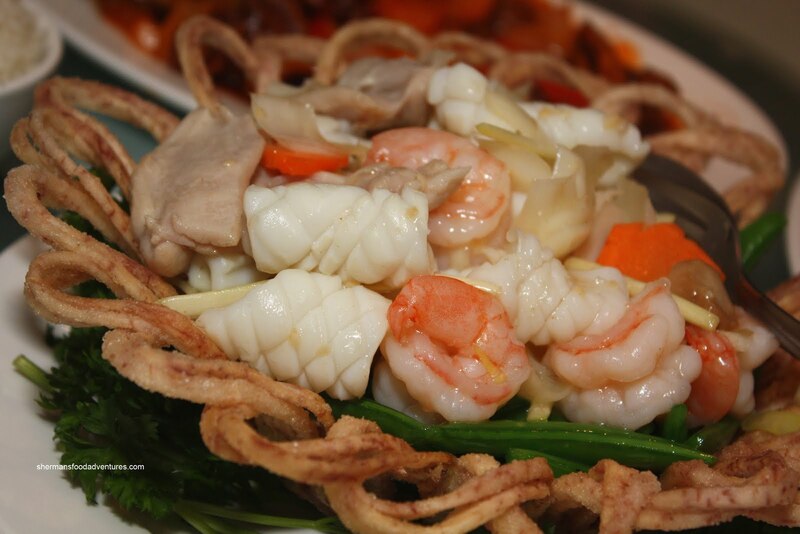 It's a good thing that the next dish, Bird's Nest was good. Lots of properly cooked shrimp, squid, chicken and snap peas presented in a crispy taro 'bird's nest". My son loved it... the crispy taro that is. Yah, like he would eat any of the other items. This was probably the best dish of the night. One dish we had to order in advance was the 8 Treasures Braised Duck. It's a whole duck that has been roasted, deboned, then stuffed with eight different ingredients (hence, 8 Treasures), then braised. 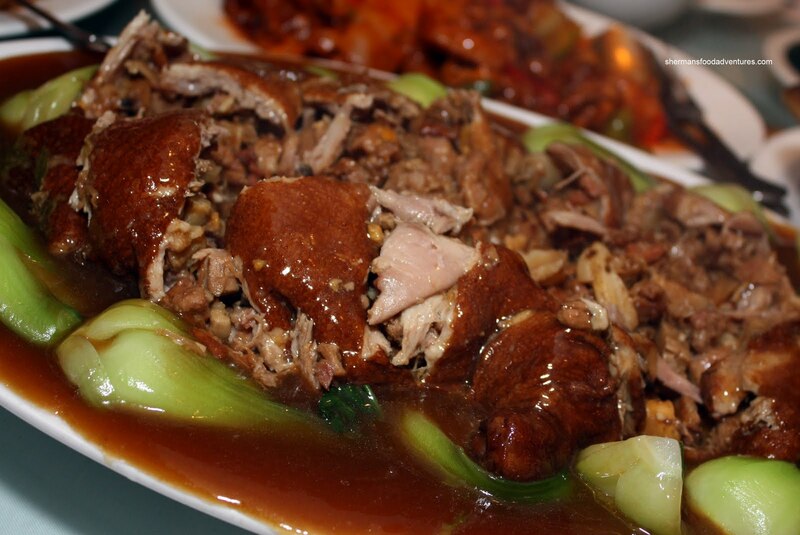 The result is usually a smoky, rich flavoured moist duck with a delicious stuffing. In this case, the duck was indeed smoky, tender and flavourful. Maybe a bit too much flavour in the form of salt. You see, the duck is already marinated and roasted. Adding more flavour in the form of stuffing may put it over the top. It looks like they overseasoned the stuffing and the result was a pretty salty duck. Don't get me wrong, it was good, just too much flavour. Couldn't even taste the duck. Another decent dish was the Silky Tofu and Enoki. 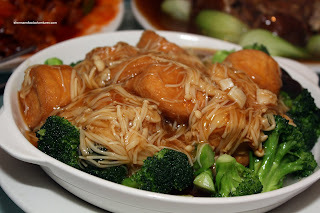 The fried tofu and enoki were wok fried in a oyster-based starch thickened sauce and served over broccoli. Each individual component was done right and the sauce was a nice balance of sweet and savoury. 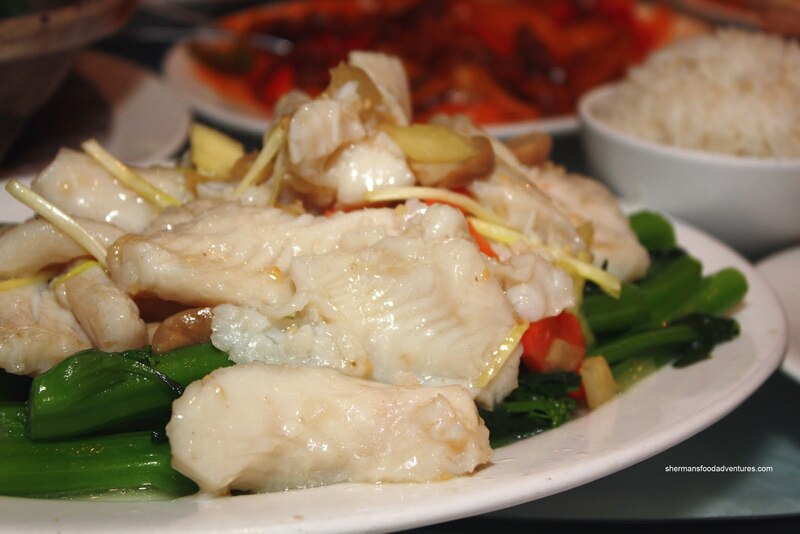 Last dish of the night was Gai Lan with fish slices (which we believed was Basa). The gai lan was fresh and cooked just right exhibiting that crunch when bitten into. Not much in the way of seasoning; but that is a good thing in this case. The fish was fine, possibly a bit overcooked. This was a really telling visit at Kirin City Square. For the longest time, I've held Kirin in high-esteemed since they did offer up some of the best Chinese food in town. However, with recent visits, I'm not so sure anymore. In fact, considering the prices, I would even go as far to say it is downright disappointing. I mean, if the food we ate this time was served at a dive, I would be somewhat forgiving. However, we're eating at a Chinese equivalent of fine dining... with the prices to back it up! One would expect a certain level of execution and consistency. So sadly, I have to conclude that Kirin City Square is no longer a no-brainer when it comes to Chinese food. I've had dinners and banquets at City Square Kirin several times. Guess what ..... each and every time it was disappointing. I honestly don't get how or why they are so popular for dinners, even amongst the Chinese diners. Quality is um, consistently inconsistent. Definitely not worth the prices. Luckily none of those times I ate there I had to pay, hehehehe. Very good review. 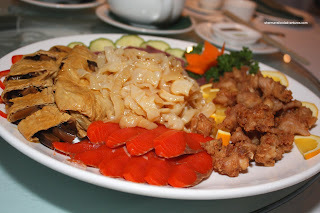 I used to be a "Kirin person"...but with the years and experience (before I moved to Vancouver I believed that Chinese food was like Portuguese food, but only deep-fried or steamed) I have to agree that Kirin is overpriced and the execution is, many times, clichéd and trivial. I suspect they are hanging on by virtue of dim sum and large banquets, not your typical evening dinners (to which there are waaaaay better places to go with far lower prices). But yeah, their rent must be sky high !